Ghotit literacy software solutions help struggling writers and readers to improve their reading and writing skills. Ghotit allows children and adults to better cope with their reading and writing work assignments in both work and in school. The Ghotit solutions are ideal for people with dyslexia and dysgraphia, and have proven to dramatically improve their writing and reading capabilities. Ghotit solutions provide value for a wide audience, starting from students in elementary school and up to high school, and higher education. Employees who need to regularly read and write as part of their work responsibilities can dramatically improve their working efficiencies when aided by Ghotit. At the core of Ghotit’s patented technology is an advanced set of phonetically, grammatical and context-aware algorithms that assist struggling writers to produce error-free text. Ghotit solutions offer a wide range of services that can assist a user in his reading and writing. A user who struggles with his typing can be assisted with the Ghotit’s Word Prediction service to increase his writing pace. 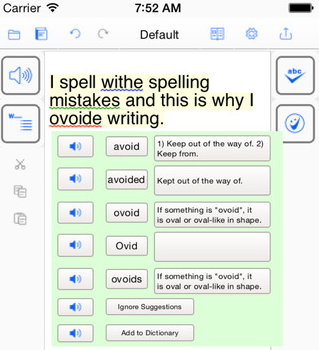 A user who produces text with many spelling and grammar errors can utilize Ghotit’s Text correction service to produce error-free text. A user who needs to validate that his text is correct before sending it can run the Ghotit Proofreader service, to ensure that what he wrote is what he intended to communicate. Spelling Corrections: Advanced spell checking algorithms, taking into account that the written text spelling can be way-off from the correct word spelling. Grammar & Punctuation Corrections: Unique grammar correction algorithms making sure that also the grammar and punctuation are correct. Misused Words: Ever spell a word that was recognized as a correctly spelled word, only to find out later that you wrote the wrong word? If so, Ghotit Misused Words service, identifies such errors based on the context of the sentence, and warns you while you are writing the text. Split and merged words: Ghotit makes sure that you do not mistakenly split or merge words incorrectly. An integrated dictionary: Displays the meaning of each predicted word (including an example sentence with the predicted word). Read out loud: Reads the corrected word and meanings out loud. The Word-Prediction service is a great productivity tool that assists people who type slowly. Ghotit Word-Prediction offers user predictions inline when the user is typing, allowing the user to select predicted words, and thereby, reducing the amount of typing required by the user. The Word-Prediction service takes into account grammar considerations. Additionally, the Word-Prediction service offers predictions based on words with similar phonetics. In order to assist the user in selecting the correct Word-Prediction, an integrated dictionary displays the meaning of each predicted word (including an example sentence with the predicted word). The predicted words can then be read out loud – for the user to hear the predicted word before selecting it. Self-learning algorithms are applied, so that Ghotit learns better the prevalent vocabulary of each user. A personalized word bank is managed for each user. This is leveraged to optimize the word prediction service for each user. When you finish writing any text, it is recommended to proofread it. 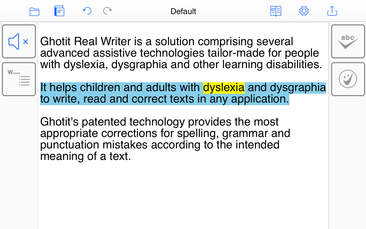 Ghotit solutions can help you proofread your text by reading your text out loud sentence after sentence. When a word is read, dual highlighting is performed on the text. Both the sentence and the current word are highlighted and colored – to ensure easy proofreading tracking. Ghotit reading services is a vital tool for those who struggle with reading. Ghotit solutions can help you read any text by reading the text out loud sentence after sentence. When a word is read, dual highlighting is performed on the text. Both the sentence and the current word are highlighted and colored – to ensure easy tracking. 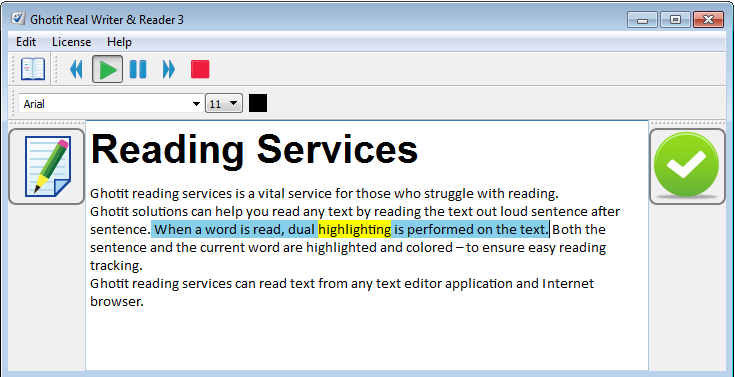 Ghotit reading services can read text from any text editor application, Internet browser. The Ghotit services can be accessed using different devices and applications. Ghotit services can be accessed directly from any desktop/laptop text application. This includes Word, Excel, Outlook, Pages etc. Mobile apps can share text with the Ghotit application, transferring written text for review and correction. Once corrected, the Ghotit application can share the corrected text with other applications. Ghotit standalone, a simple to use text editor is included. Ghotit standalone editor is available for both desktop, laptop and mobile devices. Ghotit’s diverse modes of operation support users with different working methods. Some users will want to correct their text directly from an application; while other users will prefer to use a dedicated, user-friendly text editor. Ghotit supports all modes of work, in order to maximize productivity and text quality for a wide range of users. Ghotit is used by many individuals, families, educational institutes and business organizations. Special home, educational and enterprise licensing models are offered. My most preshis poseshin is my qwad bike because I think it is wiked. My most precious possession is my quad bike because I think it is wicked.